Spin Frustration in Three Ions. Scientists have demonstrated a new way to control quantum interactions that makes it possible to fine-tune the way in which the magnetic properties of trapped atoms couple to, and are "entangled" with, those of their neighbors -- a development with potentially important applications in quantum computing and condensed-matter simulations. The ability to selectively control the quantum states of a large array of objects is a necessary prerequisite to practical quantum information-processing, just as the ability to control connections among groups of transistors is at the heart of conventional electronics. However, any eventual quantum computer will almost certainly rely on a phenomenon unknown to classical physics: entanglement, the condition in which the states of two or more objects become so inextricably connected that none of them can be described separately. Trapped ions are considered to be one of the most promising platforms for inducing, sustaining and managing entanglement among numerous objects. Now physicists at the Joint Quantum Institute and the University of Michigan have devised a way* to entangle the spin states of three adjacent ions and to control the nature of the spin couplings. "Spin" is a property of atoms and subatomic particles that causes them to behave like minuscule bar magnets, with a polarity conventionally described as either "up" or "down." Thus correlating the spins of two confined ions is relatively straightforward: Both spins can be up, both can be down, or one can be up and one down; and each of those conditions entails a slightly different energy level. 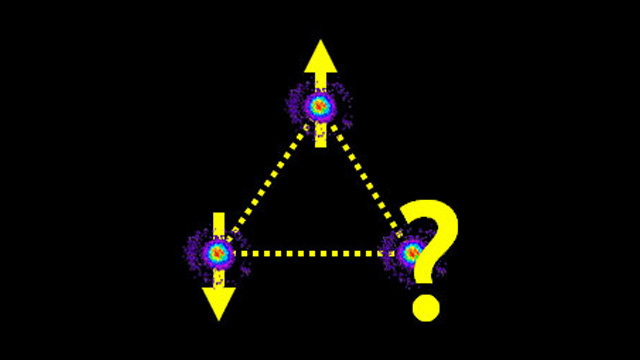 The case of three ions, however, poses a challenging problem because there are three competing interactions (between Ions 1 and 2, Ions 2 and 3, and Ions 1 and 3) which produce four possible outcomes: all spins up, all spins down, or two in one direction and one in the opposite direction. It is this last possibility that is problematic. In general, two of the three ions will find it energetically favorable to "anti-align" -- that is, to end up with their spins in opposite directions like two bar magnets laid side-by-side with the north pole of one next to the south pole of the other. But in that situation, the third ion has no preferred orientation. As a result, the entire system is caught between two equally energetically unfavorable alternatives, a condition called "frustration." The very uncertainty of that condition, however, makes it potentially exploitable as a means of creating entanglement among groups of ions and even ensembles of groups. The JQI team set out to understand and control the behavior of such competing magnetic interactions by trapping ytterbium ions in a vacuum chamber with electric fields generated from nearby electrodes. The ions come to rest and form a linear chain with 2 to 5 micrometers space between each ion. The researchers then direct two laser beams at the chain from opposite sides of the chamber. Each ion responds to the laser beam in a way that depends on its spin orientation, oscillating very slightly in a direction perpendicular to the axis of the ion chain. This "transverse" motion changes the relative positions of the ions and provides a force between them through their electrical repulsion. As a result, the spin properties become strongly correlated through the transverse mode of motion, which is controllable by tuning the laser. "All previous experiments with trapped ions have used axial modes, which is sort of like compressive motion of a bunch of masses connected by springs," says JQI Fellow and group leader Chris Monroe. "Think of the way a Slinky toy gets longer and shorter as you let it hang from your hand and then move it up and down. But the problem with axial modes is that their frequencies are all over the map. It's very hard to deal with them all. Sort of like hitting a drum -- no nice tone, but a bunch of chaotic notes that don't sound well together. "The transverse modes, however, are like modes of a violin string, with all modes at nearly the same frequency. A beautiful tone indeed. This is important because in order to do our experiment eventually with 100 or 1000 ions, we don't want to deal with all of those dissonant modes and instead want them to be bunched up and happy together. If you add 1000 violinists to the orchestra, it's a lot louder but still sounds good. But put 1000 unruly teenagers yapping on their cell phones into a room, and it's cacophony." After the team determined that the simple tuning of the laser frequency and its application time could cause the ions to move in ways that were dependent on -- but also affected -- the way the ions' spins were coupled, the next question was: Could they control it? They found that by carefully correlating the laser forces with spin configuration, they were able to identify which beam properties and time intervals produced a given pattern of spin alignments, and how to tune the beam to produce a desired condition. That is equivalent to the kind of control provided by sequences of logic gates in electronic circuits, but with the added feature of entanglement among the three ions. "The same system is scalable to lots more particles," Monroe says. "It should be ideally suited to quantum simulation of magnetism, a task at which classical computers fall flat."